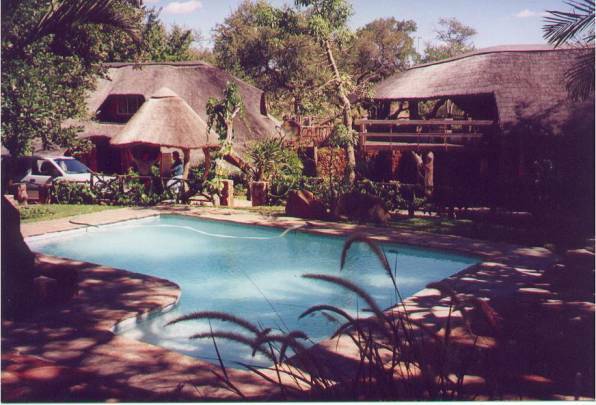 My hosts, Peter Tinkler and Vaughan Humphrey of Fast and Fresh Logistics had kindly invited me to join them for a weeks hunting at Sand River Safaris in the Limpopo Valley in the Northern Province of South Africa. It was thus with much anticipation that I commenced preparations for this, which included a decision to take along my 7x57 mm and 375 H&H rifles built on Mauser actions. A few hours drive from my home near Pretoria had us well ensconced in the bushveldt, without a doubt my favourite part of the world! After introductions to the camp staff, selecting rooms and unpacking we were off to the range to check the rifle’s zero’s. Much advice was given and received while we observed each other’s groups. We returned to the base camp, cleaned and stowed the rifles before relocating to the dining area for pre-dinner drinks. Following a significant dinner and more than a few cocktails around the fire listening to the bush’s melodious refrains we all turned in for a welcome night’s rest. We were woken up in pitch-black darkness to the tinkling of the coffee tray and the “mornings” of the very friendly camp staff and PH. After a few cups of coffee and some rusks we piled onto the backs of the shooting cars and undertook a fairly chilly drive to the drop off points. Each hunter was dropped off with an experienced tracker and assigned a sector to work. My tracker and I took off across a flat area of savannah towards the far kopjes (hills) slopes which were just starting to bake in the early morning sun, just the kind of place that kudu love to bask off the chill of the previous night. We moved at leisurely pace, stopping every so often to check the wind and cast for spoor. I passed up a very nice Nyala bull as he moved along with his cows… a quick stalk showed him to have one magnificent horn whilst the other drooped straight down. A trophy not to my liking. Once we got into the Mopani shrub we slowed down to snails pace and stopped every few minutes to listen. This is a good time to squat down and look through and under the bush as opposed to staring straight into the thick stuff and wonder how the hell I’m going to spot anything. In the process, we crossed quite a bit of spoor made a lone elephant, probably the grumpy cow we had been warned about. I kept a sharp lookout once the spoor got fresh as she has a reputation for being very cantankerous and charges on sight. Fortunately she had opted to move out of the area we hunted, and we were able to focus on a kudu trophy. We opted to move up a dry streambed that tracked up the side of a large kopje and still allowed us the benefit of the wind in our face. On reaching the top of the kopje, which just happened to feel like climbing one of the fabled seven peaks in terms of steepness, I took time out to glass the surrounding hillsides and plains below. I saw a few zebra, eland, blue wildebeest, herds of impala but no kudu. This was repeated every half hour for the next four hours while we attempted to set a local record for kopje clambering but turned up no kudu at all. Somewhat despondent, I held a short conference with the tracker and decided to take a wildebeest. Thus agreed, we set forth with renewed enthusiasm for the chase and closed on two herds after some dallying about with a wind that was now starting to swirl unexpectedly. One herd had a very nice bull that showed promise of running way into the 30” category. He was however not inclined to stay put nor show himself for clear shot in the very very thick bush. Not wanting to risk a shot being deflected by the bush, despite having my 375 loaded with 300gr Barnes X’s, I passed up the bull and broke off the stalk. At this point the sun had started its turn to a downward path and it was time to start the ten-mile walk back to the pick up points. A short radio conversation with the PH had us set to be picked up and returned to camp and reunited with some very frosty Castles, lone survivors of the night before. After the pick and while driving slowly back along the dirt track in a now much relaxed frame of mind and chatting to tracker that the Kudu bull made his appearance. We stopped dead in our tracks and watched in amazement as this very large bull broke cover and, with a bark, loped casually across the track from left to right and ran up the kopje. Needless to say my tracker and I bailed over the side of the truck and took off after the Kudu bull up the kopje like scaled cats. I vividly recall trying to estimate his horn length while recharging the rifle already made safe for travel while at the same trying to watch my footing across some treacherous lose rock and anticipating which way he would break. Given we were making enough noise to be heard in Cape Town, it must have prevailed on the bull that he best stop to see what had put him to flight. The bull thus turned on his tracks on the leeward side of the kopje and ran back straight over and into us. Again all came to a grinding halt while we stared at each other head on for a split second. I threw up my 375 and got my breathing to stop for but a moment while the cross hairs settled on the neck … I caught a glimpsed of the bull going down at the boom while I worked the bolt again. The second shot was not needed and my tracker and I moved forward to claim the trophy. I stood staring at this regal animal thinking how lucky I had really been and that on day one. Not much later, the truck came grinding and bouncing it’s way up the hill with some of the other trackers chopping out a trail in front of it while we did a quick post-mortem of events. The bullet had taken him smack in the middle of the neck, somehow missing the vertebrae and exiting to the right side without as much as touching the body. He measured 55 inches with three full curls all the way up to those lovely ivory points. After much backslapping and all round congratulations we took the necessary photos, loaded up the bull and made our merry way back to the base camp. 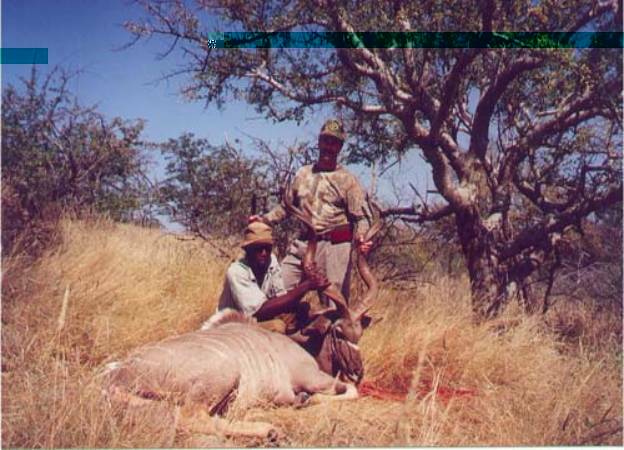 A few points to bear in mind for kudu hunting is that they are real “skelm” or sneaky, it is not for nothing that they are called the “grey ghosts of the bush”. A nice bull can be surprised like mine which can be capitalized on by running after the bull as nine time out of ten they will stop and look back over their shoulders to see what spooked them, quick shooting and good bullet placement will get you a trophy. Kudu are also very fond of sunning themselves early in the morning, thus glassing the surrounding countryside will often show up a nice bull, the stalking of which you can now plan from your vantage point.